Back in 2013, in amidst the summer movie lineup that consisted of popular theatrical releases like Iron Man 3, Fast & the Furious 6, Man of Steel, The Purge, and Despicable Me 2, moviegoers experience the titular conflict man versus monsters in the film Pacific Rim. Directed by famed creature creator director Guillermo Del Toro, this movie, which starred actors Charlie Hunnam, Idris Elba, Rinko Kikuchi, Charlie Day, and Ron Perlman, centered around a group military pilots, who pilot gigantic robots (Jaegers), battle against huge monstrous beings (Kaiju) that seeks destruction everywhere they appear. The film itself was a somewhat homage to the old “giant monster” films of old (stated Del Toro), with a mixture of Japanese anime and succeed in doing so, bringing a Hollywood cinematic nuance touch towards the proceedings. While the movie did have it share of problems (amongst critics and moviegoers), the film did succeed at the box office, especially thanks to the foreign box office that cultivated roughly $309 million along with the US domestic box office profit of $101 million to make for a sizeable profit of making over $400 million against its $190 million production budget. Pacific Rim’s profits didn’t necessarily break records or make it into the top ten highest grossing movies of 2013, but it was enough for the studio to green light a sequel to further continue the conflict between the Jaegers and Kaiju. Unfortunately, the path to Pacific Rim 2 was wrought with trouble, including several delays that almost derailed the project and was almost to be shelved indefinitely. Luckily, the project didn’t come to that and (almost five years since the first film), Universal Pictures (as well as Legendary Pictures), and director Steven S. DeKnight finally present the follow-up sequel to Pacific Rim with the movie Pacific Rim: Uprising. Does this long-awaited second installment deliver on some “giant” robot / monster entrainment or is it just a stupid and mindless sequel? Ten years have passed since the “Battle of the Breach”, where war hero Stacker Pentecost (Idris Elba) sacrificed himself to help close the breach and prevent anymore Kaiju from coming to Earth. 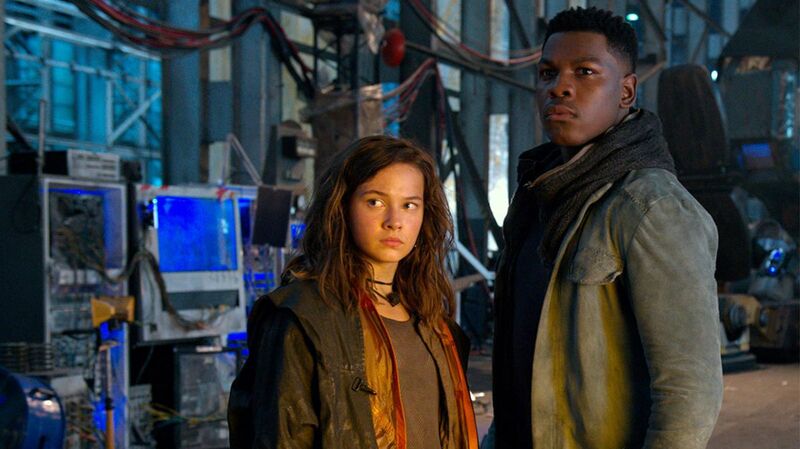 Stacker’s son, Jake Pentecost (John Boyega) is not like his father, living his life as a thief, stealing parts from broken down Jaegers to sell on the black market. However, his “easy carefree” life of thievery changes when his latest score is interrupted by Amara Namani (Cailee Spaeny), a young scavenger scrapper girl who has built a small Jaeger of her own. The pair are captured during their getaway and are whisked off to the PPDC (Pan Pacific Defense Corps), with famed Jaeger pilot Mako Maori (Rinko Kikuchi) giving Jake the choice of jail or to reenlist as a Jaeger pilot. Jake, begrudgingly and with much annoyance, chooses to return to service while Amara excitedly enlisting as one of the new recruits. Once back within the ranks of the PPDC, Jake must work with his former Jaeger co-pilot Nate Lambert (Scott Eastwood) to train the new cadet class, of which Amara is a part of. Jake soon learns that a private corporation, spearhead by Liwen Shao (Jing Tian), with the help of Dr. Newt Geiszler (Charlie Day), is gearing up to launch a new Jaeger prototype, which are now to be piloted by drones to protect humans around the world, leaving “manual operated” Jaegers (and their pilots) obsolete. Unfortunately, while Mako, Dr. Hermann Gottlieb (Burn Gorman), and much of the PPDC facing the possibility of being removed from duty, a new threat emerges in the form a rogue Jaeger, ultimately unraveling into the nefarious plan that seeks the return of the Kaiju from beyond the breach. It’s up to Jake and the rest of the Jaeger pilots to face this new enemy and to cancel the apocalypse once again! Man, I remember 2013. That was way back when I decided to follow my passion for films and started blogging about movies (when Jason’s Movie Blog was first in infant stages). I actually started that summer with Pacific Rim being my #4 movie that I’ve review. Haha…. that definitely feels like a lifetime ago (literally). Anyways, Pacific Rim (to me) was a great spectacle of blockbuster film. To be honest, it’s the very definition of the summer popcorn blockbuster. It’s big, loud, bombastic, heavy of visual effects, broad character arcs (and their development), and was entertainingly fun. Yes, the movie did have its fair share of problems (mostly in its bloated runtime, it’s minor character building, and in its more “human” narrative (i.e. when the camera wasn’t focused on the Kaiju / Jaeger fights), but the film was fun and entertaining (the cast was great and the concept was intriguing), providing just the right amount of big-budgeted movie escapism that many (including myself) were hoping from the giant monster / robot genre. In the end, Pacific Rim succeed in what it was suppose to do and was a far more memorable movie that summer than a lot of other box office flops (i.e. The Lone Ranger). Naturally, I was super excited when it was announced that the studio behind Pacific Rim was going to green light a sequel. However, as I stated above, the path in getting Pacific Rim 2 (later to be titled as Pacific Rim: Uprising) off the ground was filled with many obstacles. This was mainly due to the fact that a conflict between the studios (Universal and Legendary) that produced and financed the movie. The disruption halted the sequel project, which led to the departure of Guillermo Del Toro (who originally was going to return to direct the movie) as well as actor Charlie Hunnam, who played Raleigh Beckett in Pacific Rim (the film’s main protagonist). As stated above, Pacific Rim: Uprising was eventually shelved indefinitely and almost never saw the light of day. Thankfully, the studios worked everything out and the Pacific Rim: Uprising was eventually made, which brings us to the present. With such a large gap into between the first one, I did wonder on how this belated sequel would ultimately shape. The film’s casting and various promotional marketing (movie trailers, TV spots, and magazine articles) kept my interest peaked, cultivating in a form of personal anticipation and expectations to when the movie was finally release. So, what did I think of it? Well, I’m kind of mixed about it. While Pacific Rim: Uprising does offer a bigger and visual second Jaeger / Kaiju outing installment, the film loses Del Toro’s vision and offers a more goofier and less desirable sequel. There’s definitely fun to be had in the movie, but it lacks the potential cinematic escapism that first film had. With Guillermo Del Toro regretfully not return to the project, the baton is passed to Steven S. DeKnight in helming Pacific Rim: Uprising. While he doesn’t have theatrical motion picture background, DeKnight’s credibility derives from the small screen; acting as director and producer for a few TV projects like Angel, Smallville, Daredevil, and Spartacus. Thus, DeKnight makes his theatrical directorial debut with Uprising. As a whole, it’s pretty obvious (from the get-go) on how DeKnight wants to handle this feature….by means of elevating the film’s actions and playing up more of a classic “rock’em, sock’em” giant monster / robot fight within the film’s story. Kind of like the stuff that’s found in B-rated giant monster movies or something like an old Power Rangers episode (but with a heftier budget and on a more grandeur scale). By doing this, DeKnight also makes the battles between the Jaegers and Kaiju more enticing and exciting than first film did. The level of destruction is amped up to the max and as many of the battles sequences are well-choreographed with the Jaegers moving in and fighting in interesting ways (again…. more so than the first Pacific Rim). The Jaegers themselves move and function better, yet still remain unique / creatively design with some pretty cool names (i.e. Gispy Avenger, Bracer Phoenix, Saber Athena, Obsidian Fury, etc.). I personally had that little “nerdy childhood” fanboy geek out when I saw these giant Jaegers in action. Also, there is a tad bit more humor in Uprising (more on the below), which helps the movie become more self-aware in a few parts. This, again, leads to the film to be more “fun” that the original film. Also, there’s a twist in the movie that I was thought was very interesting to be use and gives a unique dynamic in the Pacific Rim’s world building mythology and possible future installments (if one ever does get greenlighted). Much like the first film, Uprising’s overall presentation is displayed beautifully as a blockbuster feature. Many of the scenes within the movie, especially noteworthy the battle sequences, are rendered stunningly in intricate CG visuals, bringing to life all the monstrous Kaiju and the colossal Jaegers to life, along with all other the various sequences of them battling against each other. Thus, the entire visual effects must be commended on their work on Uprising. I suspect that this movie’s visual effects might be considered for the next upcoming award season (in the Best Visual Effects category). It may not win, but I assume it will at least on the “short list” of nominations. In conjunction with that, the movie’s cinematographer Dan Mindel should also be commended for his work on Uprising, providing some very creative and cinematic shots with various usage of light and camera works. To say that Uprising’s visual presentation is great is just an understatement. Much like what I said above, if you come into this movie wanting a CG visual spectacle only, then you’ll won’t be disappointed. All the other technical aspects in making Uprising, from its production design (Stefan Dechant), to the set decorations (Gillian Butler and Cynthia La Jeunesse), to the costumes designs (Lizz Wolf) are pretty good in the right “industry standard” for a big-budgeted sci-fi action blockbuster feature. Lastly, the film’s musical score, which was composed by Lorne Balfe, with a lot epic and bombastic background music to help aid in the film’s endeavors of bring the big battles of monsters and robots fighting on a grand scale. Problems do quickly arise within the movie, making Uprising falter from either passing or come to stand shoulder-to shoulder with the original Pacific Rim movie. Perhaps one of the most notable difference between the two films is the ultimately direction that Uprising takes. What I mean is that DeKnight’s vision for this Pacific Rim sequel takes different direction to what Del Toro’s film. On the whole, movie itself doesn’t take itself to seriously. Yes, there are some big time “life or death / end of the world” scenarios that happen throughout the film, but it’s all presented in a more “B-rated” cheesy film, which is a tonal shift from the first movie, which was presented in a more serious matter. Again, I know that the first Pacific Rim movie wasn’t exactly a masterpiece on being a serious drama (I mean the movie was about giant mecha robots fighting against giant monsters), but at least it was decently well-rounded and told an engaging blockbuster story from start to finish. There’s also a problem is the film’s pacing, which seems to be unbalanced the movie from onset to conclusion. Naturally, things do pick up during the third act, but the first act (and parts of the second act) lack a tight pacing narrative path as if DeKnight doesn’t know what to focus on (i.e. juggling through different narrative threads that he has a hard time intertwining together). Uprising just seems subpar and feel like a movie “trying” to be like the original film rather than being an extension of it. Honestly, Uprising has that sort of feeling like Independence Day: Resurgence (taking a somewhat different stance on a sequel to well-liked blockbuster film). I won’t say that Uprising isn’t a total failure (in both quality and entertainment) like Resurgence was, but it’s hard not to make that comparison. Another problem is in the film’s narrative being told. The movie’s story and script, which was penned by DeKnight as well as Emily Carmichael, Kira Snyder, and T.S. Nowlin, is, more or less, bland and far less robust than the previous film. Perhaps one reason could be there were too many “hands” (writers) in the script’s pot. Uprising has a lot of good ideas, especially when the film introduces certain elements (i.e. a new smaller Jaeger that needs only one pilot can operate or the sudden appearance of a “rogue” Jaeger, etc. ), but does a poor job in executing them onto the big-screen. This is the classic take on something that’s good “on paper” and doesn’t translate well when brought to life. Adding to that, Uprising’s seems to missing a lot of backstory within the Pacific Rim universe. Of course, the film takes place ten years after the events of the first movie, but it seems like a lot of backstory context information is missing as if we (the viewers) need some sort of Pacific Rim 1.5 to helps bridge the two films together. The film’s beginning tries to catch up viewers on what happened, but it just seems too vague. There’s a lot of questions that I have about the state of the world and the state of the Jaegers organization since the ending of the first film, but Uprising sort of glosses over it, which might many, including myself, a bit confused and perplexed throughout. Heck, did anyone know that the aliens, who sent the Kaijus across the “Breach”, were called the “Precursors”. Or what is the fate of Pacific Rim main hero character Raleigh Becket. He’s mentioned in the movie but is never presumed dead neither. What gives? Again, it’s all vague and I wish they (the writers) would’ve spent more time on fleshing out the story as Uprising could’ve been something truly great as blockbuster. As it stands it only makes for a dumb fun blockbuster with a thinly sketched plot and bland story narrative angles. Additionally, DeKnight seems to abandon certain aspects that were initially setup by Del Toro in the first movie. This includes the concept ideas of the Kaiju are worshipped as “gods” by religious fanatics as well as the idea of “drifting”, which seems to take a backseat. For those who don’t know (or can’t remember), Jaeger pilots drifting is made easier when it’s shared with someone of blood (i.e. a sibling or parent), which Pacific Rim demonstrated through some of its characters as well as the emotional baggage it takes when the two pilots are linked together. It wasn’t required to become a Jaeger pilot, but it made it easier. Uprising sort of dismisses that notion altogether and makes “drifting” more mainstream. With the numerous delays to Uprising, actor Charlie Hunnam, who played Pacific Rim’s main protagonist character Raleigh Becket in the first film, was unable to return to the sequel project due a scheduling conflict with previous other acting engagements. This, of course, means that the movie was in need of finding a new “hero” to lead the charge against this new Kaiju threat. Luckily, DeKnight (along with casting personnel Sarah Finn and Kristy McGregor) found a capable replacement with actor John Boyega stepping in the role of Jake Pentecost, Pacific Rim character Stacker Pentecost’s wayward son. Known for his roles in Detroit, Attack the Block, and Star Wars: The Last Jedi, Boyega shines bright as Jake, giving the character the right amount of cheekiness and rebellious-turned hero attitude and bravado. The dialogue given to him isn’t the most compelling with a plenty of B-rated cheesy one-liners, but Boyega chews through his dialogue with great ease and vigor. To be honest, the movie’s comedy aspect would’ve never worked as much if it wasn’t for Boyega’s deliver of lines, which wouldn’t work so much if Hunnam returned the feature. That’s not to say that Boyega is adept in being the stoic leader archetype when he’s called upon for Jake to be, but his natural charm presence works better than most actors / actresses in the film. In short (and for the most of the film), Uprising is the “Boyega” show with Jake being the central figure and most fleshed out (and fun) character of the entire cast. The next big character in the movie is actress Caliee Spaeny, who plays the character of Amara Namani, a young scavenger / scrapper who gets unintentionally caught up in Uprising’s events when she first crosses paths with Jake. Known for her roles in Counting to 1000 and Backseat, Spaeny is okay as Amara. She isn’t afforded the same level of screen-time that Boyega gets, but she still manages to deliver in selling the struggle of her character, despite in being “cookie cutter” and half-baked carbon copy from Pacific Rim’s Mako Mori. Where Spaeny does shine is in the witty banter that she and Boyega share. It’s kind of like a big brother / little sister back-and-forth banter and both do sell that comedy aspect wonderfully. Next is actor Clint Eastwood (serious he’s being getting a ton of roles in recent years. He must have a good agent or something), who plays the character of Nate Lambert, Jake’s old Jaeger partner. Known for his roles in The Fate of the Furious, Snowden, and Suicide Squad, Eastwood is good as the straight-laced no-nonsense Lambert and even looks the part (rugged “All-American” look). The character isn’t quite developed, but Eastwood does good with the material given to him and does have a few good scenes shared with Boyega’s Jake. Behind Eastwood is actress Adria Arjona (True Detective and Emerald City), who plays PPDC character of Jules Reyes. However, there isn’t much to her character, feeling so bland, uninteresting that Reyes hardly register on the screen. Acting-wise, Arjona does fine, but barely makes a vague impression on screen as Jules Reyes. Totally forgetful and probably is of the entire cast in Uprising. In more side / supporting roles, three familiar faces from the Pacific Rim do return in Uprising, reprising their respective characters once again for this sequel installment. Actors Burn Gorman (Game of Thrones and Torchwood) and Charlie Day (It’s Always Sunny in Philadelphia and Horrible Bosses) as the two sidekick rivalry scientists of Dr. Hermann Gottlieb and Dr. Newton Geiszler respectfully. While the first film found them (Gottlieb and Geiszler) to be more a comical parrying with each other in a side story (away from the Jaeger and Kaiju battles), Uprising takes a more different approach. They both still have comedic banter, which does work, in how both Gorman and Day deliver their lines, but their separate journeys in the movie feels slightly off-balance, finding Gorman Gottlieb acting more like a “mission control” analyst, while Day’s Geiszler seems like a half-baked idea that could’ve been more developed in the storyboard / screenplay writing process. Personally, I think Gorman’s Gottlieb is more fleshed out in this movie (i.e. more screen-time) than Day’s Geiszler. 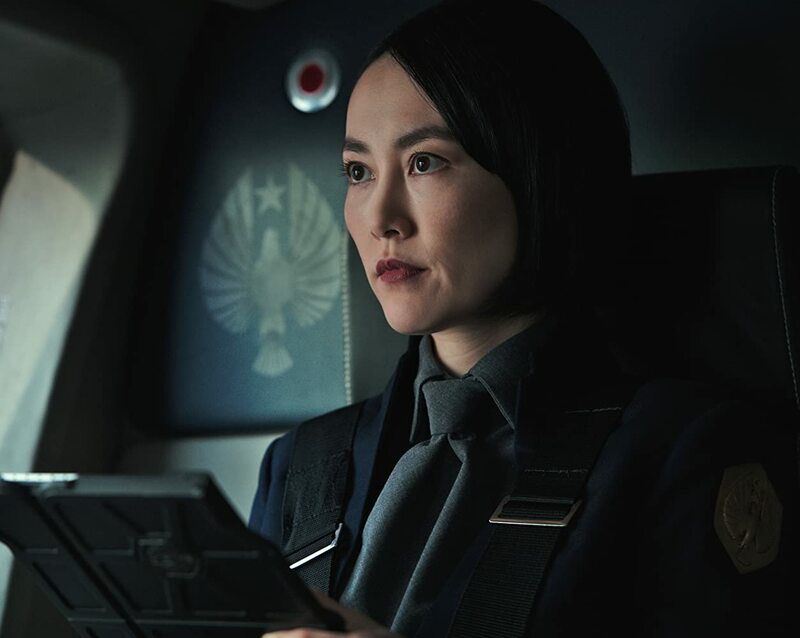 Lastly, actress Rinko Kikuchi (Babel and Kumiko, the Treasure Hunter) returns as Jaeger pilot Mako Mori, who is now the General Secretary for the PPDC. Unfortunately, of these three returning Pacific Rim characters, Kikuchi’s Mako is definitely the weakest link. It’s not so much on Kikuchi’s acting talents or anything like that, but her character is woefully underutilized in Uprising. Ultimately, Mako’s involvement in the film is more of an afterthought plot point, which is disappointing. The rest of the Jaeger new cadet recruits at the PPDC are mostly one-note (stock-like characters) that hardly register beyond a few moments. This includes actor Karan Brar (Jessie and Diary of a Wimpy Kid) as Suresh, actor Wesley Wong (Falling in Love and Qi: Spacetime Warriors) as Jinhai, actress Ivanna Sakhno (Can’t Take It Back and The Body Tree) as Viktoria, actor Mackenyu (ZAPS, Inc. and Tadaima) as Ryoichi, actress Lily Ji (Dad’s Holiday and Qiang Hong) as Meilin, actress Shyrley Rodriguez (Wheels and The Get Down) as Renata, actor Rahart Adams (House Husbands and Nowhere Boys) as Tahima, and actor Levi Meaden (Aftermath and The Killing) as Ilya. Again, they acting abilities of these young actors / actress are not into questions, but it’s hard to care about them when they barely register as characters and given mostly bland one-dimeson personalities. Basically, these new cadet Jaeger characters are “cannon fodder” for Uprising and nothing more. Of the new non-main characters in the movie, actress Tian Jing (The Great Wall and Kong: Skull Island) stands out the most as the “all-business” persona Liwen Shao, the head of the Shao Corporations. Jing is a good actress, but her character in Uprising, while important to the narrative, feels to cookie cutter and lacks substance beyond its initial plot idea. The only other non-main supporting character other mentioned is actor Max Zhang or known as Jin Zhang (Hero and The Grandmaster) as Marshal Quan, the head leader of the PPDC. As a fun side-note, Spartacus alum actor Nick E. Taraby (who played the character of Ashur in the show) and actor Dustin Clare (who played the character Gannicus in the show) have small cameo roles in Uprising as characters Sonny and Joseph Burke. The time for peace is over as a new threat emerges and the Jaegers pilots (both old and new) suit up to join the “uprising” in the movie sequel Pacific Rim: Uprising. 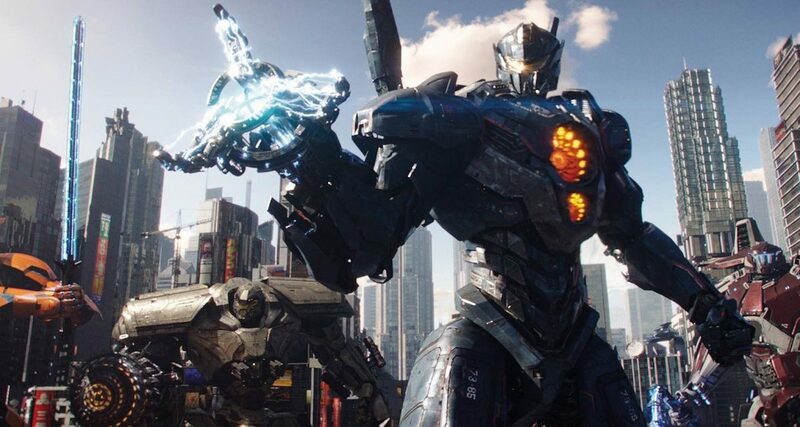 Director Steven S. DeKnight’s newest film sees the return of Kaiju, Jaegers, and young courageous people in a visual spectacle of giant monsters fighting giant robots. While there are some amusing aspects that film gets right (cool fights sequences and a stellar performance from Boyega), the movie can’t overcome its banal and undeveloped characters, its lack of substance with its central narrative, several perplexing (and confusing) plot holes, and failure to recapture Del Toro’s vision for this follow-up adventure. To me, I’m a bit torn about this movie (and still am). I mean, I kind of liked it in the way of being visual blockbuster and having a sense of fun escapism, but the movie’s missteps are far too many (and to goofy half-baked) and lacks that certain “X” quality that the first film had. 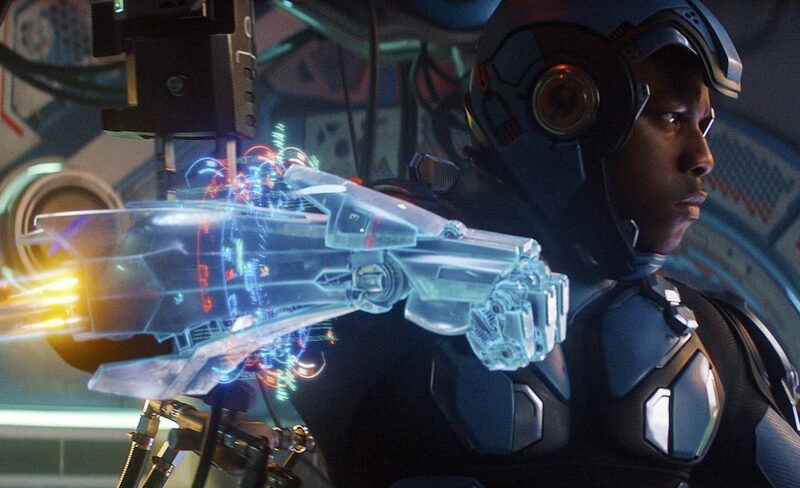 Thus, I would have to say that I would give Pacific Rim: Uprising an “iffy-choice” as some might like it (embracing its flaws), while others will dismiss the movie altogether. It’s one of those type of movies. Nevertheless, the ending of the film leaves the door open for another possible sequel. Will Pacific Rim 3 materialize in the near future? The jury is out on that decision and right now is still cinematic “limbo”. In the end, Pacific Rim: Uprising stands as a big-budgeted sequel that succeeds in being a spectacle more so than being a creative blockbuster (like its predecessor). It just goes to show how drastically different a sequel feature can be with a largely different team behind the wheel; leading to the ultimate question of how Del Toro would’ve envisioned Uprising if he was still on-board directing the project. Also, a personal side note, Pacific Rim: Uprising is my 325th movie review since I’ve started blogging (some I’ll be releasing on here from my old blog). A personal milestone for me and for Jason’s Movie Blog. Anyways…thank you to my readers, followers, and fellow bloggers. I couldn’t have done it without you!!! For such a flawed film, and some new characters I loathed, I still found myself smiling and enjoying the film. I’m surprised that the action scenes have been critizied as they are shot really well and give a good sense of scale and placement. Yeah, i agree with you, my friend. I felt the same way. The characters were pretty “meh” and the story’s narrative was clunky and jumbled, but the movie did succeed in being a visual action spectacle. I wanted to see this then after reading some reviews I didn’t. Then I did, then I didn’t. Now I want to again. Mostly for the battle scenes, I don’t go to movies like this for much of a plot. You said this is an iffy choice, which is better than others I’ve read, so I’m leaning toward giving it a chance. Usually when I’m in this situation I’ll just wait for it to get to Netflix but this one I’d really want to see on the big screen. Maybe the dollar theater a year from now might work. Thanks for the review. I’ll update my thoughts on this one, since I just walked in the door from seeing it. Characters were weak if not odd and the plot was kind of cliche. But the battle scenes, action and sheer awesome job they did making it seem as huge as everything was supposed to be made up for it all and made it a fun movie.